Pamukkale day trip from Istanbul is a comprehensive one day small group guided tour. It’s a UNESCO World Heritage Site, stroll along with white travertine rock plateaus and hear about the site’s geology. Also You will visit the ancient city of Hierapolis and learn about the history of it as you discover it’s amazing ruins. You will enjoy a cleansing soak in Hierapolis natural pools and springs. Our group tour is limited to 12-14 persons. 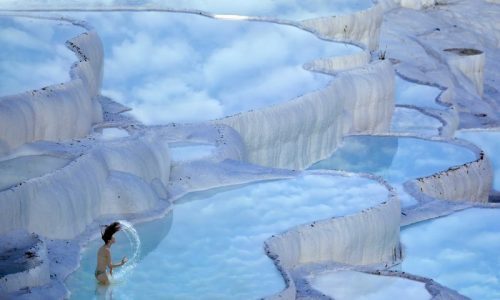 Enjoy our UNESCO World Heritage Pamukkale day trip from Istanbul in Denizli. See the ancient city of Hierapolis and learn the history of it’s ruins. We will pick you up in the early morning around 5 AM from your Istanbul hotel towards Istanbul Airport for your short 50 min. flight to Denizli Airport. Our guide will be waiting you with our air conditioned luxury bus and drive towards Pamukkale which is located in Denizli Province. Arrive at this UNESCO Heritage Site and see why this natural site name means cotton castle. 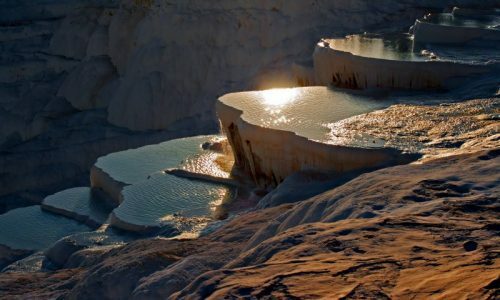 Learn about the geology of Pamukkale and see this rocks that have created a natural wonder of plateaus. 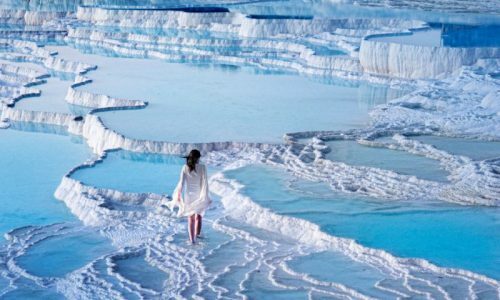 Gaze over Pamukkale’s mineral deposits and hear this hot bath water is 200 meter down the cliffside to create the appearance of snowy terraces. Stop to take photos of this amazing site then continue to the ancient city of Hierapolis to observe its history ruins and dip into the hot springs.which have been restored and converted into an archaeological museum. Spend free time relaxing into this pools and don’t forget to pack your swimsuit (entrace fees at your own expenses). Then stop for lunch at our traditional restaurant then have a walking tour through Hierapolis. Other significant sites include the Temple of Apollo, the Necropolis and the Nymphaeum. Afterwards, you will return to Izmir for evening flight or to Kusadasi for the night bus to Istanbul.